Miraflores is the nicest part of Lima. The owner of our hostel described it as “The Beverly Hills” of the city. The prices are higher here: expect to pay nearly the same prices to eat out that you would back home (or more). We typically spent about $10-15 a plate at lunch for a sit-down restaurant. Another nice area is Barranco, which is about a 30-minute walk from Miraflores. This is the artsy, hipster area of Lima. It’s cheaper, but maybe not as safe or as hopping. We spent our entire stay at the Chaski Lodge in Miraflores. 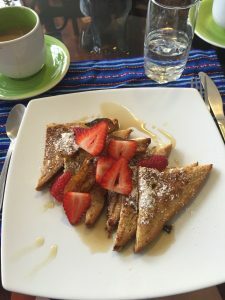 The beds were super comfortable (much thicker than the average hostel mattresses), the place was clean and relatively quiet, and most notably, we enjoyed gourmet breakfast every morning. The owner is a guy named Kevin from Utah. He was a head chef for a major ski resort in Park City before opening his hostel here, and he takes pride in his breakfasts. The only downsides to this place are that the internet can be spotty or not work in some of the rooms, and there isn’t much of a group social area, so people mostly keep to themselves. If you’re looking for a more hopping party hostel, this may not be for you. We did make some great friends here though, so it’s definitely possible to meet cool people. One of our gourmet breakfasts that always included fresh squeezed juice and coffee. 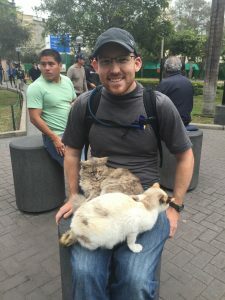 Peter and I don’t even like cats, but we loved the cat park in Miraflores. 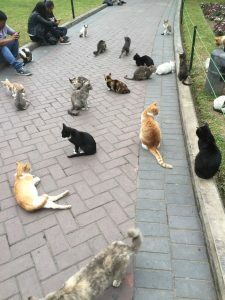 I’m talking real-life cats: hundreds of them in one park. The story goes that before there were cats in the park, there were rats. The problem got so bad that the mayor left two cats in the park to deal with it. Other people began leaving their cats there as well, and over time it’s grown to what it is today. The townspeople and tourists bring them food, and I’ve seen cat food all over, so I’m pretty sure the city feeds them as well. The cats seem content. Most of them are really chill and they love to cuddle, so it’s not unusual to get one or two curled up on your lap. If you love cats (or even tolerate them) as soon as you arrive, just ask to be directed to Kennedy Park. After the cat park, this was my favorite thing to see in Lima. Peter and I put it off for a few days because we’d only heard about it in passing a few times. We expected some fountain downtown similar to The Bellagio in Las Vegas. 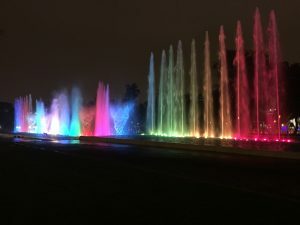 However, when we finally got around to taking a taxi downtown to this place, we were pleasantly surprised to find not one fountain, but an entire enclosed park of fountains. It cost about $1USD to get in, and we spent over an hour strolling through an array of colorful, interactive water fountains. You could walk through a water tunnel, run in and out of a fountain that randomly changed it’s water circuit so you never knew if you would get splashed, and see one of the highest water geysers in the world. We had a blast. One of the many fountains at The Magic Water Circuit. Make sure to go after dark. 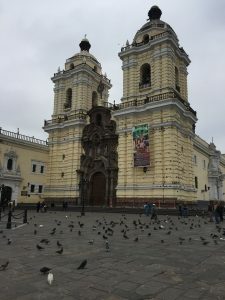 If you have a day or two in Lima, make sure to take one or both of the free walking tours with limabywalking.com. They have one for downtown Lima and one for Barranco. We tried another walking tour, but easily preferred this company. We learned a lot of fascinating facts about Peru’s history and political system, and I got to taste free Pisko (which is a classic South American alcohol). The tour is on a donation only basis, so be prepared to pay something, although you decide how much. 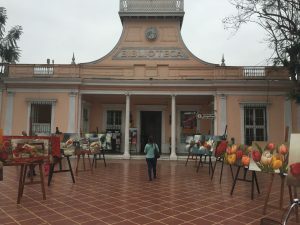 The central square in Barranco- the art district. If you get creeped out easily, this may not be the place for you, but I found the catacombs in downtown Lima to be fascinating. Under the Monastery of San Francisco, 20,000-30,000 Peruvians were laid to rest. Anthropologists dug them up and separated their bones into groups in the mid 20th century, so you go deep underground to find piles of femurs, pelvises, and skulls in open graves. It’s pretty chilling. The church itself is full of old paintings that they are still in the process of discovering under its walls. If you are looking for a sandwich with amazing flavor and sauce, La Lucha is the place to go. 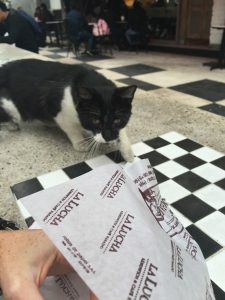 There are two locations in Miraflores: one is facing a street and stays very busy, but the other you’ll find less than a block further up tucked away in front of a bunch of public chess tables. After going through the center of Kennedy Park and crossing the streets towards McDonald’s, take a slight right instead of going to the La Lucha on your left. It’s right next door to a popular burger restaurant named Republica (that also looks good). This kitty was ready to eat right out of my hand! This was an unassuming café that Peter and I stumbled upon one night off the main road in Miraflores. We ended up going back to eat the next day. 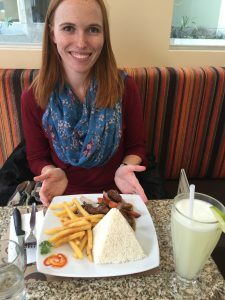 They had surprisingly tender beef in their Lomo Saltado, which is a traditional Peruvian meal of marinated strips of sirloin, onions, and tomatoes with French fries and rice. If you aren’t in the mood for a full meal, you also have your choice of fancy coffee drinks, crepes, and desserts.To get there, get onto Alfredo Benavides when you see the Atlantic City casino, and walk about two blocks: it’s on your right. This was an awesome gelato and dessert shop in Barranco’s main square. We had Stracciatella and blueberry cheesecake gelato, but you could pick from Dulche de Leche, mango, and many others. There are several other places to eat and things to do in Lima, but these were some of our favorites. 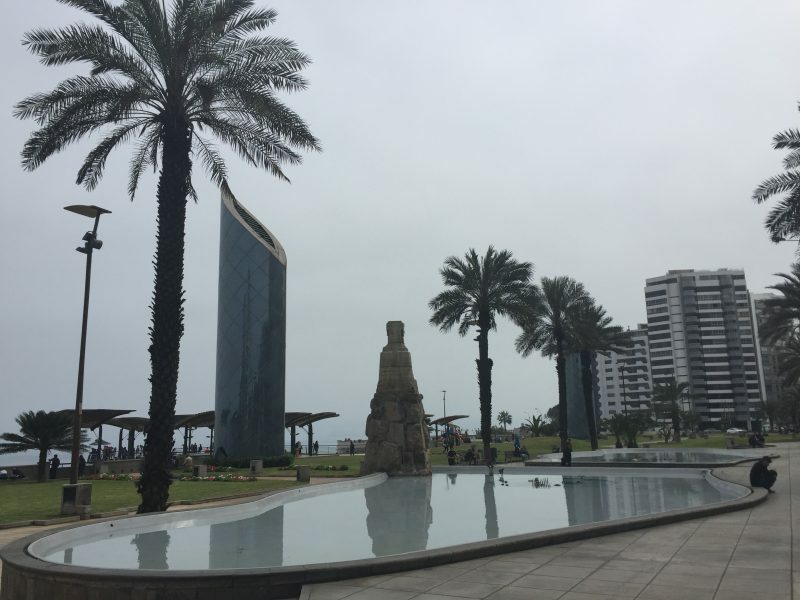 One thing we recommend skipping is the ruins in Lima. In our opinion, they weren’t much to look at and not worth the long walk. If you have more time in the city and you like history though, we heard the Gold Museum and the Larco museum were both worth checking out. (Although they cost about $10USD per person for admission.) If you’ve been to Lima and you have places to recommend, post it in the comments below!